Finished in silver anodised and black platform the feet. Load cells OIML C3 G35 model in stainless steel, protection IP68. Non-slip rubber on the bottom of the foot for better grip to the surface. The weight of an individual platform is used for commercial transactions.EC-M divisions refers to the individual weight of the platform. The total weight of the vehicle is used for commercial transactions depending on customers application. Wheel weighing system, where the number of platforms is the same to the number of wheels of the vehicle. It is officially approved because the weight of the vehicle it is determined in a single weight. 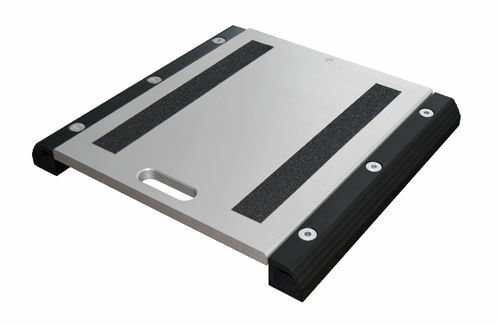 Axle-weighing system, only valid for internal use. The EC-M division which the total weight of the vehicle is indicated on wheel weighing systems (4 platforms) is the same to the divisions of an individual platform.